Humans versus 150-foot ogres. That’s the crux of Extinction’s gameplay across all of its modes, but the exact nature of your objectives - and the number of beasts you face - does differ from mode to mode. While the emphasis might lie in the game’s deep story mode campaign, the giant-slaying skills honed in it are directly transferable to the other more objective-based endeavours like wave-based Extinction mode and the Daily Challenge. Without further ado then, here’s a full rundown of all the ways Avil can make cold cuts out of the Ravenii in Extinction. The substantial story mode focuses on Avil, the last of the Sentinels. He’s working in the fields of his hometown when the long-dormant threat of the Ravenii re-emerges. A monk trained in the old ways of Ravenii-slaying teaches Avil the ways of the Sentinels, an ancient order established to protect humanity from the ogres lurking in the woods outside their dwellings. Avil, evidently a fast learner, takes the fight to his oversize adversaries in a bid to save humankind itself from… well, you get it. As one might deduce from its title, the Daily Challenge poses a fresh situation every 24 hours and gives players the opportunity to complete it in the fastest time or the most proficient fashion. Online leaderboard bragging rights provide the incentive, and the mode itself demonstrates Extinction’s versatility at posing combat scenarios. Effectively a horde mode, the Ravenii just keep coming here. Avil’s objective is primarily to survive the onslaught, but also to slay as many ogres in the allotted time as possible while working crowd control on the smaller Jackal enemy types and keeping civilians safe. He’s got his hands full, then. This is where killing Ravenii is treated like a kind of art form. Skirmish mode is about generating the highest score possible by slaughtering enemies a quickly and precisely as possible, then seeing where your effort placed versus the rest of the community on the online leaderboards. In Trials Mode, the focus is just as much on saving civilians rather than beheading giant ogres. Although, just to be clear, there’ll be plenty of that too. The setting and parameters differ with each trials, so Avil needs to adapt to each new situation in order to prevail, often focusing on one particular skill or aspect of his moveset. 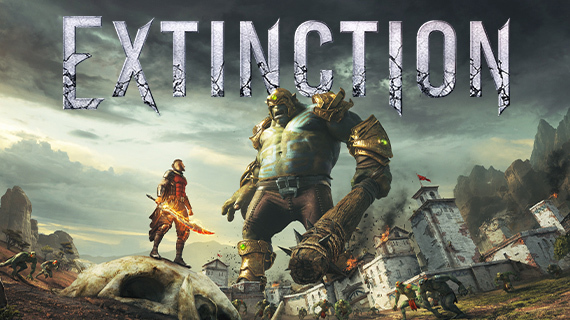 Extinction is about 1v1 encounters against vastly bigger and more powerful enemies. Explore all the moves and special avilitie Avail has at his disposal to prevail against the giant beasts! We talked to Maximum Games about their upcoming release Extinction to get the lowdown on the inspiration behind the game and what we should be excited about!